There is no salvation to this end. Our souls are doomed! How to bring spectacular realism to the castle assault in Stronghold 2nd Edition. Right after finishing my first game of Stronghold 2nd Edition (and seeing victory slip through my fingers for the want of just one goblin) I knew I wanted to do something to bring the game to life. It was obvious the game was a keeper and I’d be playing it for a long time to come, so it deserved some special treatment. 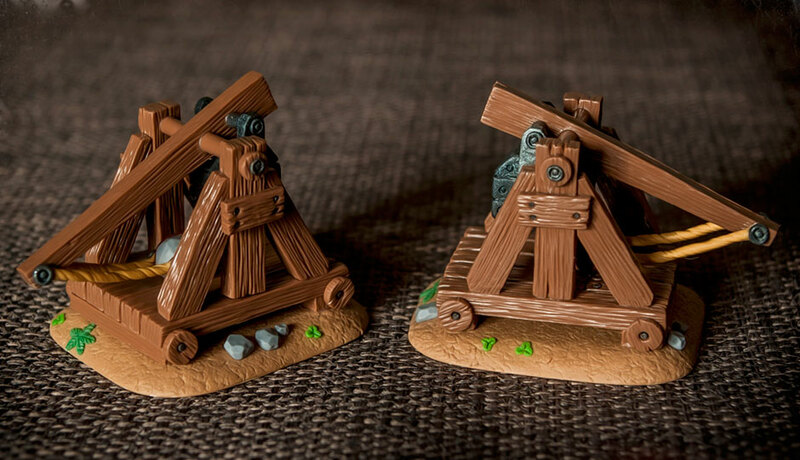 Any gamer worth his or her salt would immediately think, as I did, of somehow creating or buying 3D versions of the all-important orc siege engines. But how? Get in touch with Rom Brown, that’s how. I discovered Rom on Boardgamegeek when I saw his beautiful creations for Ignacy Trzewiczek’s other fantastic game, Robinson Crusoe: Adventure on the Cursed Island. I immediately had to have some, and after checking out what he could do on his website, Cult of Game, ordered a set of food, wood and fur tokens. Each is a stunning, individual work of art carefully sculpted from polymer clay and ‘fired’ in the oven. They’re even more amazing when you realise that they’re not painted; instead Rom selects the appropriate clay colours, and lovingly recreates realistic textures using a series of techniques that were probably developed as a result of some kind of ritual involving demon summoning, a contract and a fountain pen dipped in his own blood. 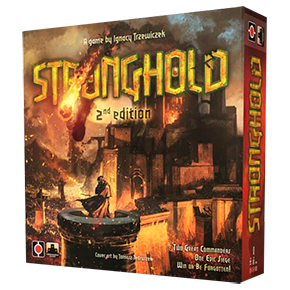 So you can guess what started going through my mind when I put Stronghold 2nd Edition and Rom together in my head. And some time later, this star-kissed union has produced probably the most beautiful set of game components on the planet today. Think I’m exaggerating? Have a look at the photos (there are many more on his site and in a series of posts detailing the project) and I think you’ll agree. Of course, these gorgeous little suckers don’t come cheap. Rom is a craftsman – nay, an artist – who is absolutely dedicated to quality, and more than 60 serious hours went into their making. I wil admit to a moment of horror when I worked out how much the set would cost me. But then a quick calculation made me realise how little Rom actually receives per hour for all his obsessively hard work. If you’re a gamer who’s serious about the visual impact and immersiveness of your games – and of course you are, you’re an Esoteric Order of Gamers reader! – you’ll appreciate their true value. You’ll also appreciate what a set of components like this can do to an already wonderful game like Stronghold 2nd Edition. I’ve only played one game with them so far, and you’ll be happy to know it was filmed for your entertainment, so expect to see it in about a month. But already I can’t imagine a game without them. They truly do bring the game to life. It’s all very well moving a cardboard tile up to the stronghold wall and calling it a siege tower, but trundle one of these bad boys up to the wall and see the real fear in your opponent’s eyes! 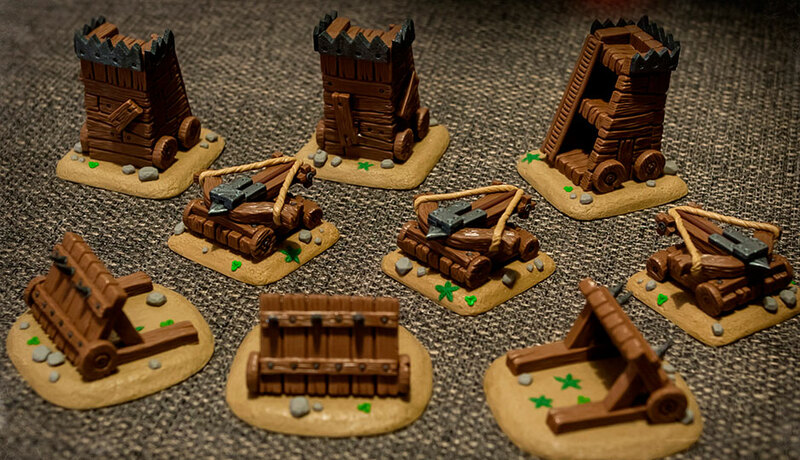 I highly recommend checking out Rom‘s site to see his beautiful work, and if you play Stronghold 2nd Edition, Robinson Crusoe: Adventure on the Cursed Island, or Mice and Mystics, consider commissioning him to make you some very special game pieces. Or you may do as I did, and come up with a whole new creative challenge for him. I think you’ll agree that the results are unique in the boardgaming world. Next up, archers, soldiers, goblins and trolls?